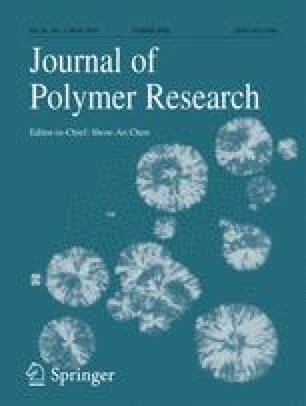 In this work, polyamide 6 (PA6)/reduced graphene oxide (RGO)- toluene-2,4-diisocyanate (TDI) composites were fabricated by reactive melt processing, and effect of formation of crystalline/network structure on electrically conductive properties of the composites was studied. The molecular bridge effect of exfoliated RGO-TDI resulted in the homogeneous dispersion of RGO in PA6 matrix. 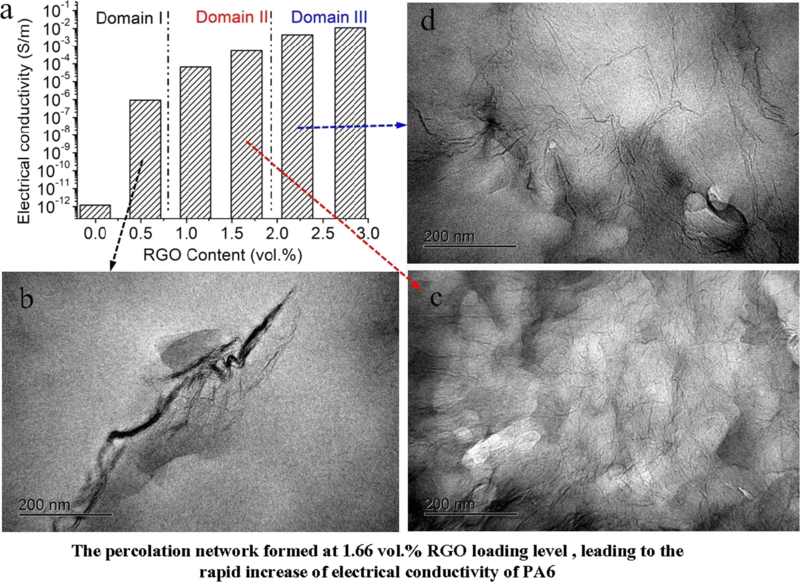 Crystallization analysis shows that RGO facilitated the crystallization of PA6 matrix mainly via accelerating the generation of crystal nucleus, reaching maximum of Xc and minimum of crystal grain size upon RGO level of 1.66 vol.%, which confirmed the formation of most perfect crystalline structure. According to the dynamic rheological analysis, both frequency-independence of G’ and sharply reduce phase angle at low-frequency region with RGO loading level of 1.66 vol.% indicate the transition from liquid-like to solid-like rheological behavior, where terminal to non-terminal transition as well as Cole-Cole arc and rapidly increasing entanglement density confirm the formation of percolation network structure with RGO as a crosslinking center. Corresponding to the analysis above, the electrical conductivity of the nano-composites increased rapidly to the equilibrium value, resulting from the formation of perfect conductive network at RGO loading level of 1.66 vol.%, which was confirmed by TEM analysis. The percolation network formed at 1.66 vol.% RGO loading level, leading to the rapid increase of electrical conductivity of PA6. This work was supported by Fundamental Research Project for Changzhou of China (CJ20180056), and Science and Technology Project of Sichuan Province (2019YFG0240).